Interactive: Hover and move your mouse around the screen in the rain. This is as a simple interactive environment based on the idea of being together with someone even though you cannot see them. Below is a GIF of 2 people interacting with it. The project is a rainy forest in which the only indication that anyone else is there with you is where the rain is falling. If there is a gap, there must be another person present. After testing it out with a few friends, it has become apparent that not only is this something you must be looking and waiting for, but that you may find yourself seeing gaps or "ghosts" that aren't really there. It attempts to combine anonymity and intimacy through the concept of simply being there with another person. You may or may not know who they are, but you share a space and environment that reacts to you together regardless of how far apart you actually are. Originally, I had many grand ideas for this project. Perhaps a collaborative garden where individuals planted trees and helped care for other peoples' saplings, or a drawing program where individuals had different "parts" - branches, leaves, and flowers. In the end, this is what I had time for, and while it is simple, I think it has potential. 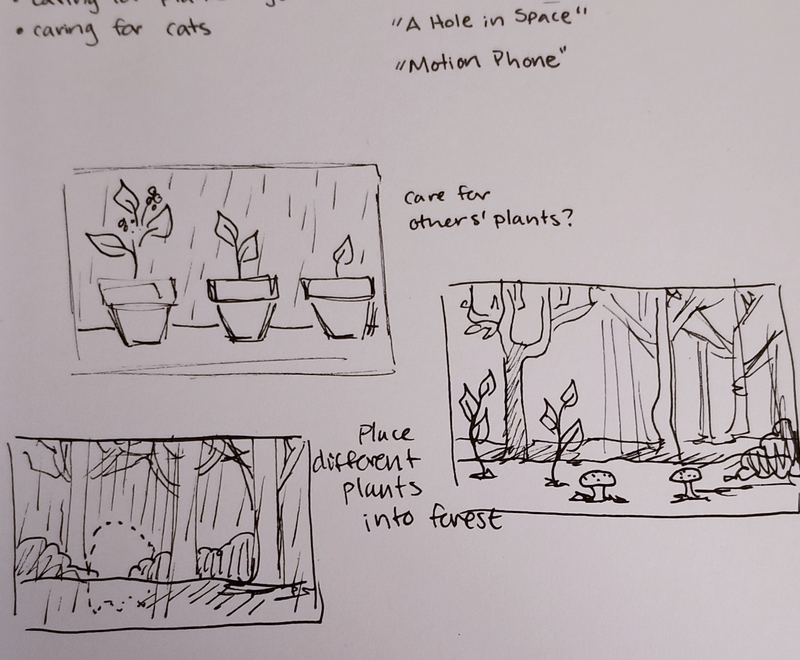 I would like to expand this first to have the drops impact and make small splashes on the ground and on the tops of the entities in the environment, and to create leaves on the bushes that would react to being "brushed past".